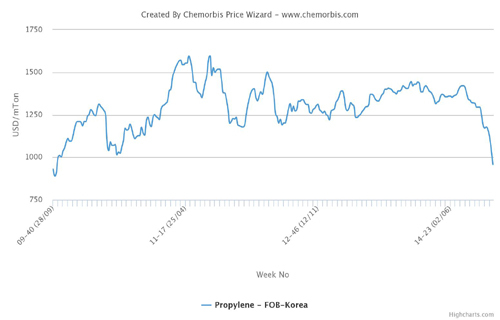 Import PP prices have been on a steady downturn in China and Southeast Asia since mid-April, according to ChemOrbis Price Index, with rising supplies and retreating costs acting as the major drivers of these ongoing decreases. The emergence of additional availability from new coal-based plants as well as the recent depreciation of the yuan in China and local currencies across Southeast Asia exacerbated the bearish sentiment in the region. 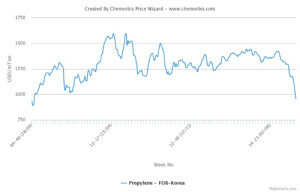 The downward trend that has been in place in the past four months is still at a full swing with dutiable import offers nearing the new lows of $1000/ton CFR in the region this week, according to players. A trader based in Ningbo, China reported receiving an offer somewhat above this threshold. “Some deals were concluded at these prices but only for small amounts. We are in no mood to accept this level as we expect this threshold to be broken soon,” he said. Players in Southeast Asia also reiterate their expectations about further decreases to come. They mostly point to the 6-year-low crude oil prices on the NYMEX combined with thin demand and comfortable supplies. Coal-based PP from China has been showing up in Southeast Asia for several weeks. A trader based in Malaysia also reported that they were approached about distributing coal based PP in the region while regional producers are also making aggressive offers to protect their market share against the possibility of coal-based PP exports from China. A woven bag manufacturer in Indonesia reported receiving a coal based Chinese PP offer near the critical $1000/ton threshold in the import market. “If we were to place a firm bid, we feel we would obtain prices below this level today given the lethargic demand in the midst of constantly depreciating local currencies and the recent bombing in Bangkok,” said the buyer. The last time homo PP traded below $1000/ton CFR was in February this year in China, when the market hit the bottom following a downturn of more than 4 months. Southeast Asia did not break the $1000/ton threshold at that time, according to ChemOrbis. Understanding the power of color: What Is Your Brand’s Identity?